That crystal pool is in caves a pool, generally having little or no overflow, containing crystals .? A brief info about recent explorations in the Krubera Cave; the cave topo, a flash with Arabika and Ortobalagan maps, profiles and aerophotos. "The Call of the Abyss" Project is a multi-year project aimed to the exploration and study of deep caves in the two outstanding limestone massifs: Aladaglar massif in the Eastern Taurus ( Turkey) and Arabika massif in the Western Caucasus (Abkhasia). The project is run by the Ukrainian Speleological Association, and involves institutions, individual cavers and karst scientists from Ukraine, Turkey, Britain, France, Spain, Moldova, Russia, Lithuania, Israel and other contries, with support of the Abhazian autorities. The main goal of the Project, officially adopted in 2000, was to discover, explore and study the first 2000m+ deep cave on Earth. This goal has been achieved successfully in 2004, but the project contunues as the ultimate depth in caves under exploration is not reached yet. In 2004, the expeditions of the Project have been supported by the National Geographic Society, USA. The Leica Geosystems Company of Switzerland kindly sponsored laser distometers used for topographic surveys in the explored caves. Help with caving equipment had been provided by the Ukrainian "Traverse", "Atlantida", and "Megacom" companies and the Slovak "Meander" company. The official carrier of the project expeditions to Turkey was the "Motor-Sich" company in 2004, and the "UkrFerry" company in 2002, 2003 and 2005. Their sponsorship and help is greatly acknowledged. Arabika is an outstanding alpine karst massif in the Western Caucasus, were many deep cave explorations have been made since 1980, including Krubera-Voronja (-2196 m) and the nearby Arabikskaja system (Kujbyshevskaja-Genrikhova Bezdna; -1110 m) in the Ortobalagan Valley. Other prominent caves in various sectors of the massif are Iljukhina system (-1240 m), Dzou Cave (-1080 m), Moskovskaja Cave (-970 m) and the Sarma Cave (-1830m). The hydrogeological potential of Arabika had been proven to be over 2300m by dye tracing tests conducted in 1984-85. The exploration of the Krubera cave to -1710m by the Ukrainian Speleological Association had established a world depth record in the beginning of 2001. For the first time in the history of speleology, the deepest cave in the world has been explored outside of the Western Europe. The subsequent chronicle of explorations in Krubera follows below (in the reverse order). In the period of August 5 � September 3, 2009, the Ukrainian Speleological Association have conducted the next regular expedition of the CA project to continue exploration of Krubera (Voronja) Cave and other caves of the Ortobalagan Valley in the Arabika Massif (Western Caucasus). The group of 5 cavers led by Yury Kasyan continued exporing the Nekujbyshevskaya Branch in Krubera, building on the achievements of recent years there. Nekujbyshevskaya is a distinct branch that diverges from the main one at -250 m and stretches to the north-west, in the direction opposite to the overall trend of the Main Branch. Starting from the depth of about -750 m, the Nekujbyshevskaya Branch turns to south-east and stretches toward the deep section of the Main Branch. In 2009, the Ukr.S.A. expedition has reached depth of -1,557 m in the Nekujbyshevskaya part. After passing a 2-m long sifon that terminated exploration in 2009, the group has pushed the cave for 140 vertical meters, to a next (narrow) sifon. This has increased depth of the Nekujbyshevskaya Branch to -1,697 m. The group has also discovered and mapped two new passages at the level of about -1,300 m, adding almost 300 m to lenght. The total length of the Krubera Cave became 16.058 km. The total depth remains at -2,191 m, as established by a 46 m deep dive in the terminal siphon in the Main Branch performed during the 2007 Ukr.S.A. expedition. Updated profile, plan and a 3-D outline model of Krubera Cave can be viewed by clicking on respective graphic icons at the top of this page. In the period of August 7 – September 3, 2009, the Ukrainian Speleological Association have conducted the next regular expedition of the project to continue exploration of Krubera (Voronja) Cave and other caves of the Ortobalagan Valley in the Arabika Massif (Western Caucasus). In this expedition, led by Yury Kasjan, 52 cavers participated from Ukraine, Russia, Moldova and Israel. A separate team of 20 cavers from Lithuania, Hungary, Spain, Ireland and UK, led by Ajdas Gudajtis (Lithuania), have also worked in Krubera under close coordination with the Ukr.S.A. expedition. The major effort of the Ukr.S.A. expedition was focused on the Nekujbyshevskaya Branch, a distinct branch diverging from the main one at -250 m and stretching to the north-west, in the direction opposite to the overall trend of the Main Branch. Starting from the depth of about -750 m, the Nekujbyshevskaya Branch turns to south-east and stretches toward the deep section of the Main Branch. The branch had been explored by the previous Ukr.S.A. expedition in 2008 to a siphon at -1384 �. Now this siphon has been tested but turned to be narrow and choked by debris. Nevertheless, a bypass for this siphon has been found, which led to a new part explored and surveyed during the expedition for depth of 170 m and length of 1251 m. Depth of the Nekujbyshevskaya Branch has reached 1557 m, and total length of the Krubera Cave became 15486 m.
Depth of the Krubera Cave, the deepest cave in the World, remains at -2191 m, as established by a 46 m deep dive in the terminal siphon in the Main Branch performed during the 2007 Ukr.S.A. expedition. During August � September 2008 the Ukrainian Speleological Association (Ukr.S.A.) have conducted the next regular expedition of the "Call of the Abyss" Project to Krubera (Voronja) Cave in Arabika Massif, Western Caucasus. The expedition, led by Yury Kasjan, consisted of 25 members including� cavers from Ukraine, Russia, Lithuania, and Ireland. In the Main Branch, cavers have checked several side leads within the interval of -1350 � 1790 m and made another attempt to get through the boulder choke at the "old bottom" (2001), in the Chamber of Soviet Speleologists at -1710 m. These efforts did not give significant results. In the period August 5 � September 15, 2007 the Ukrainian Speleological Association (Ukr.S.A.) have conducted the regular expedition of the "Call of the Abyss" Project to Krubera (Voronja) Cave in Arabika Massif, Abkhazia. A scientific program of the expedition and cave surveying has been supervised by the Ukrainian Institute of Speleology and Karstology (UISK). The expedition, led by Yury Kasjan, consisted of 41 members including 29 cavers from Ukraine (Kiev � 9; Simferopol � 6; Poltava � 5; Kharkiv � 4; Sevastopol � 2; Ivan-Frankivsk � 1; Khmelnitsky � 1; Kamenetz-Podilsky � 1), 10 cavers from Russia (Moscow � 5; Ufa � 2; Kazan � 2; Novokuznetsk � 1; 1 caver from Belorussia and 1 caver from Great Britain. Some other cavers from Dnepropetrovsk (Ukraine) and Moldova, which have been working in the area as separate groups, also helped in Krubera operations. 2) The Nekujbyshevskaya branch, a distinct branch diverging from the main one at -250 m and stretching to the north-west, the direction opposite to the overall trend of the main branch. Following the major breakthrough made by the previous Ukr.S.A. expedition, the team led by Kyrylo Markovskoy explored many new passages and pits there to the depth of -1293 �. Altogether, 2510.5 m of new passages has been surveyed during this expedition. The scientific program performed during the expedition included temperature measurements, geological observations, microbiological sampling and sampling of clastic sediments (for mineralogical analyses) and speleothems (for dating and isotope analyses). In the period between August 19 – September 20, 2006 the Ukrainian Speleological Association (Ukr.S.A.) and the Ukrainian Institute of Speleology and Karstology (UISK) have conducted a regular expedition of the CA Project to Krubera (Voronja) Cave in Arabika Massif, Abkhazia. The expedition was led by Yury Kasjan and consisted of 16 speleologists from Ukraine (from Kiev, Kharkov, Simferopol, Sevestopol, Poltava, Dnepropetrovsk and Kamenetz-Podilsky) and Russia (Moscow and Irkutsk). New explorations have been made in different parts of the cave, as well as various scientific observations, including the lowermost part. A major progress has been achieved in the Nekujbyshevskaja Branch (a distinct branch diverging from the main one at -250m and stretching to the north-west, the direction opposite to the overall trend of the main branch) by a team led by Kirylo Markovskoj. They continued exploring a new part, discovered and pushed to a boulder choke at -643m in 2005 after breaking through the upper boulder choke at -490m. During this expedition the choke at -643m has been also broken and the branch pushed to -1004m, a point where the team run out of rope. 1) The lowermost part below the “Kvitochka” siphon at -1980m has been resurveyed. The depth of the post-siphon section (to the spit at the table of the “Two Captains” siphon, the one at the bottom) is measured to be 164m. 2) The “Two Captains” siphon has been dove by Gennady Samokhin for 40m in length and 14m in depth, to the point where he was stopped by a squeeze. So, the new overall depth of Krubera Cave is now -2158m (see notes on survey data below). The absolute elevation of the lowermost reached point in the cave is about 100m a.s.l. but it still far (more than 12km) from the Black Sea coast where the discharge from the system occurs. 3) Some new explorations have been made in the lower part of the cave: an ascending side passage at -1710m has been explored for 150m/+20m; a dry bypass of the siphon “Unitaz” at -2068m has been found; a siphon at -1775m (first tested in August 2004) has been dove by G.Samokhin, who passed a narrow place at -10m but stopped at an underwater boulder choke in the ascending leg. The scientific program in this expedition included geological observations, various sampling (clastic sediments for mineralogic analysis, microbiologic materials, speleothems for U-series dating), temperature measurements (over 200 measurements through the depth profile in both the main branch and Nekujbyshevskaja) and observations of the seasonal groundwater level fluctuations from flood evidences. The latter suggest that the water level may arise during a year up to approximately -1700m, the fluctuation for more than 450m (during spring snowmelt floods or major rainfalls). 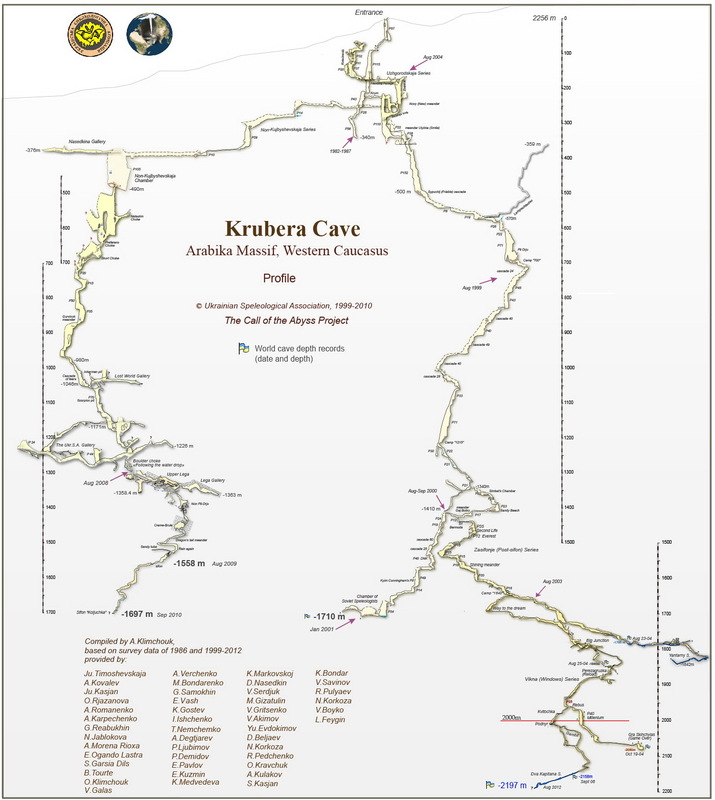 The updated map of the whole Krubera Cave will be published soon. The complete integrated Krubera survey dataset, maintained by the Ukr.S.A. through many years, consists of more than 1850 vectors to the date. Survey is performed using Suunto compasses KB-14, clinometers PM-5 (or Tandem instruments) and Leica-Disto meters or fibron tapes (all older surveys in the upper parts have been re-done during last several years). During the October 2005 Ukr.S.A. expedition to Krubera Cave a team from the Moscow Branch of the Russian Geographic Society (T.Nemchenko and A.Degtjarev), supported by the Bulgarian cavers, has conducted an independent thorough hydro-levelling work from the entrance to –1194m in the main branch, in order to verify the actual precision of depth figures obtained from the standard survey. A comprehensive methodological substantiation for the technique, and the analysis of errors involved, has been performed by A.Degtjarev, E.Snetkov and A.Gurjanov of Moscow (available in Russian in “Svet” n.29, 2005 and at http://www.rgo-speleo.ru/biblio/hydroniv.htm; now available in English at http://www.rgo-speleo.ru/eng/biblio/hydroniv-e.htm). They demonstrated that the correct application of the hydro-levelling technique allows measuring depth with the 0.2% accuracy, i.e. with an error of 4m for a 2000m depth. At the same time, they estimated that the combined error in determining depth due to some commonly practiced improper procedures could be up to 2%. The roundtripping closure (up and down measurements) for the section 0-916m (80 measurements), performed in October 2005, gave an error of 0.05m. i.e. less than 0.01%. Therefore, the results of this survey can be reasonably taken as an etalon dataset. Comparison of the standard Ukr.S.A. survey with the etalon data for particular points in the 0-1194m interval has revealed actual errors varying between +0.97 and -1.37 %, with an average error being 0.9%. Based on this, the overall accuracy of the Ukr.S.A. standard survey is assumed to be 1.0%. The results of another hydro-leveling work, performed by the Cavex team in July-August 2005 and claimed to correct the Ukr.S.A. figure for the “old bottom” from -2080m to -2064m (to -2047m in other sources), have been shown to seriously suffer from improper procedures involved. Comparison of their results with the etalon data for particular points shows the actual error of the Cavex hydro-levelling measurements varying within -0.64 and -2.2% (average 1.2%), which is even greater than the errors of the standard Ukr.S.A. survey as compared with the same etalon. Therefore, there is no reason for correction of the figure previously reported by the Ukr.S.A. for the “old bottom”. Conclusion: The overall error of the standard Ukr.S.A. survey is proven to be within 1%. The current depth of Krubera Cave, reported here as -2158m, has the margins of possible error between +22m and -22m. The next regular expedition of the Ukrainian Speleological Association to Krubera (Voronja) Cave has been carried out between February 9 – March 16, 2005. The expedition, led by Yury Kasjan and composed of cavers from Kiev (N. Solovjev and M.Bondarenko) and Novaja Kakhovka (D.Fedotov and E.Kononov), was the part of the ongoing "Call of the Abyss" project, run by the Ukr.S.A since the year of 2000. The main goal of the expedition was to systematically explore the deepest section of the cave discovered during the previous Ukr.S.A. expeditions in August and October 2004. There were many open side leads left unchecked in the Windows Series between the Big Junction at –1790m and the Game Over Chamber, the deepest point at –2080m (see the cave profile by following this link). The expedition has been brought to the cave by a helicopter on February 14. The team have continuously worked in the cave during 19 days, since February 16. After return to the surface on March 6, the team had to wait out bad weather in the mountains during six days to be picked up by a helicopter. During descend and ascent the team used established camps at –700, -1215, -1410 and –1640m. It took eight days to restore and improve all the rigging through the cave and to transport materials and supplies to the lowest camp set at the Big Junction at –1790m. Six days were spent for the work in the lower section, and it took five days to get back to the surface. 1) Many windows and side leads have been checked within the –1700m - -2080m interval. Almost all of them have looped to the known passages and pits, while some ended by impenetrable squeezes. The only window in the bottom chamber (Game Over), visible in the wall at some ten meters above the floor, has been also checked (dead-ended). 2) The siphon ("Kvitochka") in a side passage at –1980m has been dived through by Nikolay Solovjev. The siphon 10m long and 4m deep gave a continuation explored to a next vertical pitch. This is now the main direction for the further exploration. The dive was the deepest diving operation ever made in caves. 3) Two siphons in side passages near the Big Junction (around –1800m) have been tested. One of them has been dived for 7m in length and 3m in depth; it continues by an ascending leg. Another siphon (6m long, 2m deep) has connected to the known passage. The terminal siphon at –1840m, which stopped the exploration in August 2004, has not been attempted as it apparently connects to a known passage in the "Windows" series. 4) The temperature measurements have been carried out through the cave to study temperature gradients. The air temperature rises through the cave from 2.1 grad C at –90m to 7.7 grad C at –2080m, giving the overall gradient of 0.28 grad C/100m. During 2005 the Ukrainian Speleological Association will continue systematic explorations in Krubera Cave and other caves of the Ortobalagan valley in Arabika in August and September-October. Another expedition of the "Call of the Abyss" project is planned for July to the Aladaglar massif in Turkey. The Ukrainian Speleological Association is happy to inform speleologists around the world about a historic accomplishment: the first 2000m+ cave on Earth became a reality. The 2000m milestone in deep cave explorations has been vanquished in Krubera Cave, Arabika Massif, Abkhazia, during the third expedition of "The Call of the Abyss" project in the year of 2004, conducted between October 1-28. The expedition led by Yury Kasjan was composed of nine Ukrainian cavers representing caving clubs of Yalta, Kiev, Kharkov and Uzhgorod (Igor Ishchenko, Sergey Bogutsky, Dmitry Furnik, Kyryl Gostev, Ilja Lapa, Ekaterina Medvedeva, Emil Vash and Shantor Chervits). The main goal was to continue exploring the new section discovered by the previous Ukr.S.A. expedition in August. Based in the camp at �1645m behind the first sifon, the group of five cavers explored a lead deviating from the main branch some 55m above the terminal sifon. The newly explored part, named �Windows�, consist of a series of inclined passages and vertical pits (up to 40m deep), which form a complex structure in plan and profile of the total length of 1070m and depth of 290m. No big stream (active collector) has been encountered so far. The new part ended with a dry chamber (named �Game Over�) plugged with sandy and silt sediments. There are many side openings through the Windows series suggesting good possibilities for further exploration, including advance in depth. Based on a standard topographic survey made during the August and October expeditions (Suunto compass & clinometer and DisoLite laser distometer; BCRA Grade 3-4) of the post-sifon section below -1440m, added to the previous Ukr.S.A. survey for the whole cave, the total depth of the cave is found to be of �2080m. The 2000m mark and the lowest point were reached on October 19. With the entrance located at the altitude of about 2250m, the deepest point of the cave has reached the altitude of 170m above sea level, but it has not reached the top of the phreatic zone yet. The system is hydrologically linked to major springs located at 1 to 50m altitudes at the Black Sea coast at the distance of 12-16km, and also to submarine springs. Such a low gradient (less than 170m/13.000m) suggests the low hydraulic resistance of the deep sections of the massif, which is probably because the well developed conduit porosity had formed during Pleistocene periods of low sea level stands, when the drainage level was at much lower position than at present. The world�s depth record in Krubera Cave was first established at �1710m by the Ukr.S.A. expedition in January 2001. During this year the advance in 370m has been made, unparalleled in the history of deep cave explorations. The "The Call of the Abyss" Project will continue exploring Krubera Cave to its ultimate limits, and will seek to �grow up� another 2000m+ cave in the Aladaglar Massif in Turkey, yet another project study area where Kuzgun Cave has been explored to �1400m this July. Arabika is an outstanding alpine karst massif in the Western Caucasus, were many deep cave explorations have been made since 1980, including Krubera-Voronja (-1710m) and the nearby Arabikskaja system (Kujbyshevskaja-Genrikhova Bezdna; -1110 m) in the Ortobalagan Valley. Other prominent caves in various sectors of the massif are Iljukhina system (-1240 m), Dzou Cave (-1080 m), Moskovskaja Cave (-970 m) and the Sarma Cave (-1530m). The hydrogeological potential of Arabika had been proven to be over 2300m by dye tracing tests conducted in 1984-85. The exploration of the Krubera cave to -1710m by the Ukrainian Speleological Association had established a world depth record in the beginning of 2001. Besides the core of the Ukrainian cavers, the Arabika expedition in August 2004 was composed of explorers from Moldova, Spain, France, the United States, Britain, Russia and Abkhazia. In the summer of 2003, the expedition of the Cavex team and the Kiev Speleo-Club found a new branch behind a siphon at -1440m in a small passage that diverges from the main route to the -1710 bottom. This July, immediately before the Ukr.S.A. expedition, the expedition of Moscow cavers briefly explored the post-siphon section and ended at another siphon at the depth which they estimated to be �1830m. This figure had been claimed as the new world's record. The Ukr.S.A expedition in August re-explored and thoroughly surveyed this part, and found the second siphon to be at �1775m instead of �1830m claimed. The attempt has been made to dive the second siphon, the deepest diving operation ever made in caves. By reaching a squeeze at a depth of 10m under water the depth of this branch was established at -1780 m. The siphon continues down almost vertically behind the squeeze. Meantime, the detailed investigation of side passages through the whole deep section between the two siphons gave the most important discovery. On August 24 the explorers broke through a nasty side passage to a large new section, which bypassed the siphon at �1770m and steeply led to a still greater depth. On August 25 the team of four Ukrainians, one French and one Spanish (Gennadiy Samokhin, Denis Kurta, Dmitry Fedotov, Julia Timoshevskaja, Bernard Tourte and Sergio Garcia Dils) reached another siphon at -1840m, establishing the new world�s record for deep caves. The newly discovered section has many promising side leads still to be fully explored. It gives a good perspective for further depth advance. The explorers used four underground camps (at �700m, -1200m, -1400m and �1637m) to support various works through the main part of this immensely deep and complex cave. Some cavers spent continuously two weeks underground in the course of the expedition. Twelve cavers took part in explorations behind the siphon at �1440m. The expedition has made several discoveries and new explorations in some other parts of the Krubera Cave, provided for detailed topographic, photo- and video documentation of all new sections and conducted a considerable body of scientific research.